Get something to eat all day long. The hotel boasts two different restaurants, a bar and an ice cream parlour. You can taste local dishes at LE KOTÉMER restaurant just by the pool, or enjoy the brasserie atmosphere of LA TRATTORIA, overlooking the beautiful bay of Saint-Leu. And don’t miss out on the many cocktails at the hotel bar and their homemade ice cream. Inventive and eclectic cuisine prepared using traditional Creole methods and local produce. 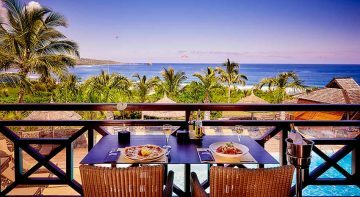 In a relaxed and family atmosphere, enjoy the ILOHA’s brasserie-style restaurant and its stunning view of the ocean, with something for everyone throughout the day. 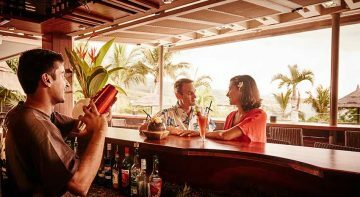 Taste our delicious cocktails with a panoramic view of the bay of Saint-Leu, or grab a tasty homemade ice cream from the ice cream parlour.